Back to Art Club today with quite large group and an expanded workspace. This term I want to offer activities that encourage the children to always be looking with the eyes of the artist, exploring, collecting and documenting what they see. I have decided to use the art club activity room as the place to explore and over the next four weeks we will try and look at it with fresh eyes, perhaps discover things we haven’t noticed before and make some art that will share our findings with other users of the room. Today we started with sketchbooks. The children closed their eyes then opened them, looked around and sketched the first few things they saw that they felt they hadn’t seen before. We tried lying on our backs to get a new angle on the space. 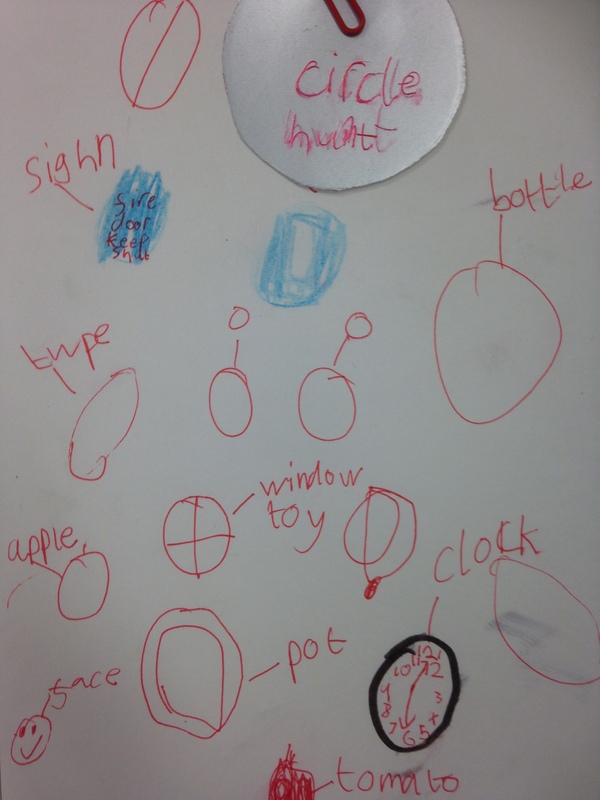 Next each child selected a shape from the table and explored the room, recording in their sketchbook the places where they found the shape in the environment. I’ve posted the sketchbook entries of a couple of the circle collectors. Finally we explored the room again this time using viewfinders. We’d looked at how using the viewfinder was quite similar to using an ipad to capture an image. 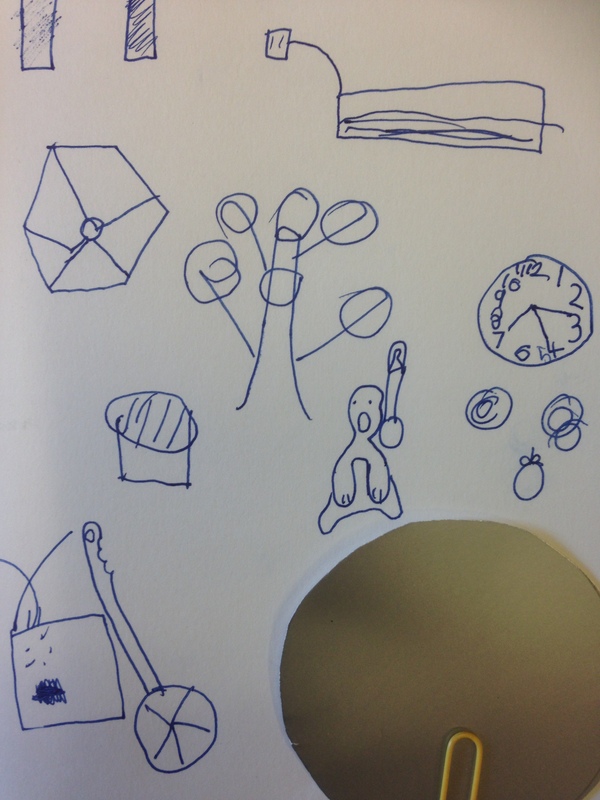 The children used the viewfinders to focus on particular areas of interest to them and to decide what to include in their drawings. They sketched in charcoal on white and in chalk on black. Here are some of the drawings. I’m still feeling inspired from my evening workshop with Cambridge Curiosity and Imagination exploring smallness. I wanted to think about this further with art club and also explore the idea of collecting as an art form. We started the session talking about what we collect and why. All the children had fascinating collections at home and could explain why they were collecting them. I wonder if we forget our motivations as we get older. Quite a few of them were collecting things to use in their artwork and enjoyed the process of sorting and categorising. I brought lots of tiny natural objects with me; shells, rats’ jaws, scapulae, lichen, dead wasps and much more. The children selected two objects and spent some time observing them in different ways; colour, texture, shape, smell, scientifically, by language, habitat, preferences. They then talked to a partner about the similarities and differences between their chosen objects. They spent a lot longer than I expected doing this and also created charts and diagrams to explain their findings. After reflecting on the first part of their collection they then selected another three artefacts to build their museum collection. I’d brought a long materials for simple construction so that the children could build an exhibit or mini museum to show their collection. Most of them opted for a hanging display so that the objects could be handled easily. Some liked the idea of semi concealing their display to add surprise and drama to the experience. I’m going to try out this project with a different art club next Tuesday so hopefully will have some museum photos then and probably a very different take on it.